Finally, the thrilling game of Russian roulette will be making its way to your living room! 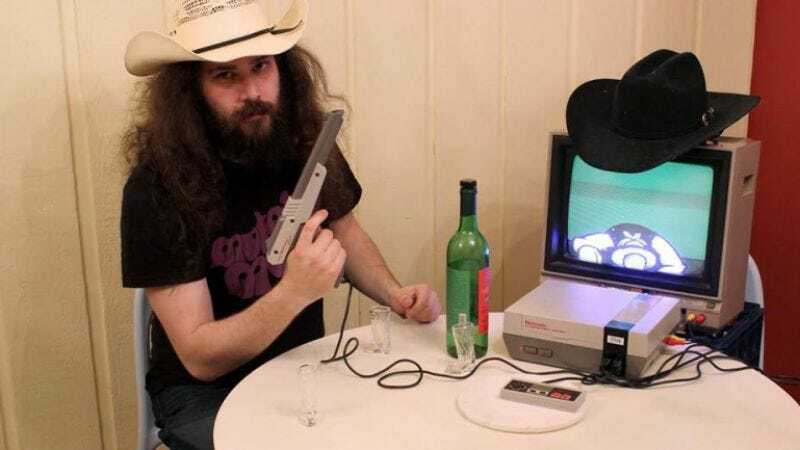 Andrew Reitano was “inspired by the best kinds of bar games” and nostalgia for the 8-bit NES when he began developing Super Russian Roulette. Since then, he has taken the cartridge—designed for play on the original NES console—on the road, and the party game was a favorite down at the Fantastic Fest arcade in Austin, Texas last year. Now, Reitano has started a Kickstarter campaign in order to bring Super Russian Roulette to the masses. There are plenty of rewards for backers of the game, ranging from a digital download of the soundtrack, a copy of the cartridge to play at home, and, for the big-time robber barons, an opportunity to make an appearance in the game. The project currently has 100 backers, and has raised $7,006 of its intended goal of $20,000. There are only 33 days to go, so if you’ve always wanted to recreate scenes from The Deer Hunter in your rec room without the messy cleanup, donate today.